John Jay College of Criminal Justice, B.S. 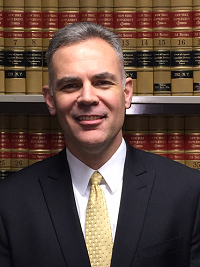 EDWARD J. HARRINGTON joined MDA&F in 2006 and became a partner in 2014. Prior to that, he worked for a number of years as staff counsel for two major insurance carriers handling both automobile and premises liability matters. At MDA&F he specializes in all aspects of litigation and trial work but focuses his practice on premises and construction litigation with some high exposure motor vehicle and products liability cases. Mr. Harrington has tried numerous cases in the various New York City courthouses and has obtained multiple defense verdicts. In addition to being a partner at MDA&F, he is a JAG in the New York Air National Guard and is presently assigned to the 105th Airlift Wing in Newburgh, New York, where he is the Deputy Staff Judge Advocate. Mr. Harrington is married and has four children who gladly take up what free time he has.